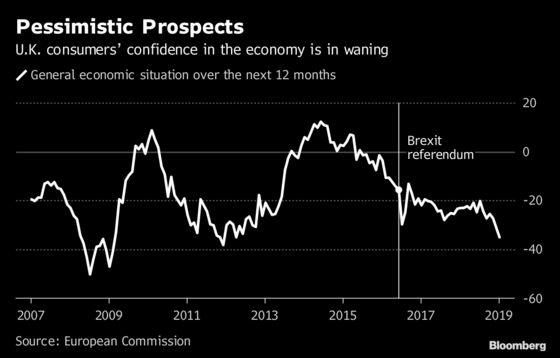 (Bloomberg) -- Concern about Brexit’s impact on the U.K. economy is growing, with consumer worries near crisis-era levels, investment falling and the property market suffering. Nationwide Building Society said Thursday that house-price growth ground close to a halt as values rose just 0.1 percent in January from a year earlier. That report came hours after research group GfK said consumers are the least optimistic about the economic outlook in seven years. A lack of clarity over the nation’s exit from the European Union is leaving households worried about Britain’s prospects. Bank of England figures show that mortgage approvals fell in December and consumer credit is the weakest in four years. 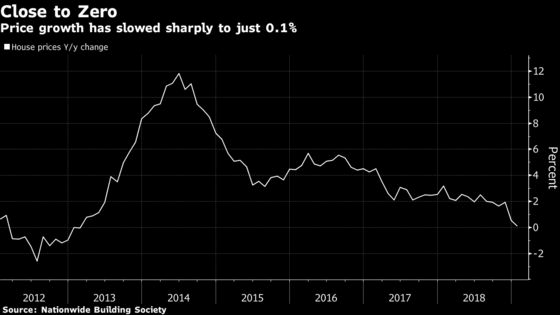 The slowdown isn’t confined to consumers, and is being felt across the U.K. economy as political chaos in Westminster dents sentiment. British Prime Minister Theresa May has yet to find a deal that’s acceptable to both the EU and Parliament, and the risk of the U.K. crashing out of the EU without new arrangements is rising as the March 29 exit date approaches. Separate figures on Thursday showed the British automotive industry saw investment plunge last year as carmakers delayed decisions on upgrading machinery and factories. Spending dropped 46 percent, the lowest since the global financial crisis. A separate report from Lloyds highlighted that businesses are also feeling the pressure. While the firm’s gauge of confidence edged two points higher this month, it remains considerably lower than 12 months ago.